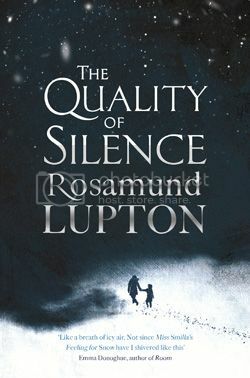 Set in the unrelenting wilderness of an Alaskan winter, The Quality of Silence tells the story of Yasmin and her daughter, Ruby. When they arrive in Alaska expecting to meet Ruby’s dad Matt, they are instead told that he has died. Refusing to believe this, Yasmin sets off on a perilous journey into the Arctic Circle to rescue him, taking Ruby with her. Ruby’s deafness, and the added danger of an unknown pursuer, lurking in the dark, mean that an already treacherous journey becomes terrifying. The genius of The Quality of Silence lies in its setting. The cold of Alaska is a character in and of itself; Ruby describes “a monster made of cold, hard as the edge of a pavement, coming towards us in the dark.” While the man who appears to be following the mother-daughter pair is a constant worry, the cold is unrelenting and inescapable. It even eats into Yasmin’s at-first steadfast belief that Matt is alive, causing her to question why she has put her daughter into such obvious danger. Excitement: Tastes like popping space dust; feels like the bump-thud as a plane lands; looks like the big furry hood of Dad’s Inupiaq parka. The narrative switches expertly between Ruby and her mother; Ruby’s story is given in the first-person, so we get to hear an intelligent ten-year-old come to terms with the situation in which she is placed, and yet still betray all of the usual fears and worries that any girl her age has to deal with. Yasmin’s story, written in the third-person, is no less personal, as she reflects on her life with Matt and, as she journeys across a harsh Alaskan landscape, goes on a journey of her own as a mother. The story explores the global issue of fracking, and how it affects the landscape and communities in the places it is used. Lupton has clearly done her research, and the novel never feels anything less than starkly real and pertinent. Ruby is one of my favourite characters in recent years, and her voice feels intensely real at all times. Leaving her behind as the book came to an end was a real wrench! I have this waiting to be read on my Kindle after getting a copy through Net Galley – looking forward to it after this review! I loved it – be keen to know what you think!